With the help of the friendly people at Sony Ericsson, I've recently taken delivery of a Sony Ericsson Satio. In this post you'll find some of my initial thoughts on this phone. The full review will be coming soon. This is an unbranded and unlocked UK version of a production Satio. It has final hardware and shipped with the R1BB041 firmware dated from the 6th of October, 2009. The Satio comes in a small, box. Printed on the box are a couple pictures of the Satio itself alongside some screenshots of applications that supposedly come with the phone. The satio feels great to hold. It's much lighter than I had expected it to be. It's made almost entirely of plastic but it feels solid in the hand. The plastic has a glossy finish, meaning that the Satio collects fingerprints very easily. When you first turn on the Satio and are greeted by Sony Ericsson's custom homescreen, there's very little to indicate that it's a S60v5 phone. Once you press the menu button, however, the S60 UI that has remained virtually the same for so many years pops up. Similarly to the Samsung i8910, the only places that have been customised are the homescreen and media applications. 2) The theme effects that are permanently on - there's no way to turn them off (at least on the default themes). 3) I haven't recieved confirmation on this, but I think there's a chance that some underclocking has taken place in the Satio's processor. 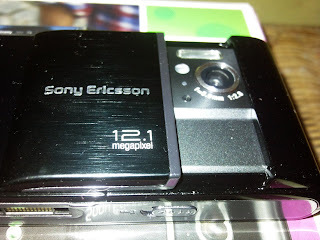 4) Sony Ericsson simply haven't optimised the software for the hardware. However, Sony Ericsson have already released one firmware update for the Satio, so, if this is a software issue, I'm sure it'll be addressed eventually. *cough* No amount of software will turn a resistive screen into a capacitive one, though *cough*. Despite having the efforts of the most recent firmware update, the Satio is still quite prone to crashing. In my unit, for example, changing the homescreen theme can cause crashes that require a reboot of the device. The Satio comes with the standard S60 web browser. When I say standard, I mean standard. There's no kinetic scrolling and it's quite slow in comparison to the Nokia N97 and Samsung i8910's updated browser. 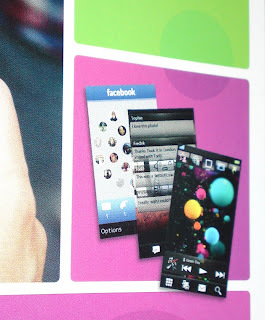 This is something that Sony Ericsson should definitely look to change in any future software updates. Did you note my use of the word supposedly near the beginning of this post? It's because Sony Ericsson are following in Samsung's footsteps and are advertising applications/features that the phone doesn't have. The facebook application, which is shown on the box, is not present in the Satio. This is where things get good. The camera on the Satio is superb. Prior to release, many critics cited the 'megapixel myth' and claimed that the Satio's 12 million pixel-count was superfluous. Though it's probably true that the increase in pixels isn't what makes the Satio's camera so good, I certainly don't mind having more for comfort. Why is the camera so good you ask? It's the speed. Shot-to-shot times are unmatched. You take the picture and it's there on the screen, saved - instantly. I love it. On the other hand, the video recording capabilities are average. The maximum resolution is 640x480, a resolution which would have been acceptable on such an expensive device in 2006 maybe. At least it's pretty much locked at 30fps. There's no initial focus, no option to record in 16:9 (stangely, this option is present in the stills part of the camera) and there's no option to record in HD. Ok, maybe I'm just nitpicking with that last one. HelloOX2 works with the Satio. Ovi Maps and Map loader work perfectly. After following my instructions here, the Ovi Store works perfectly. For those interested, I'll be publishing a post that contains a bunch of the Satio's good things (please don't sue me, Nokia) such as the entire Z drive, wallpapers and default themes. Stay tuned! If you have any questions about the Satio, please leave a comment so that I can (try to) include an answer in the final review. Thanks for the comment. I've now published the post containing the Satio's default media. Hi Mr.X. My first post here.. love your site! If I follow your guide on getting OVI to work on my Satio, will other sites recognise my phone as a Nokia N97? Managed to install Ovi maps on my hacked Satio.. But Map loader doesnt detect my phone. How do you transfer maps? Great handset by the looks of things, and a really useful review so thanks! Still not had one to demo, but am trying to get my hands on one. 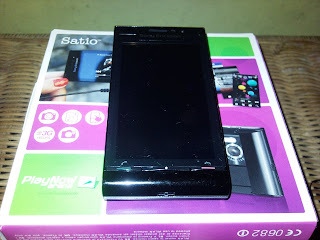 can you use the gps on the Satio without internet? if so how? To turn off internet-based positioning, go to Settings, Phone, Application settings, Positioning, Positioning methods and then untick 'Network based'. Now to get a lock, make sure your phone is pointed towards the sky and wait for a few seconds/minutes.